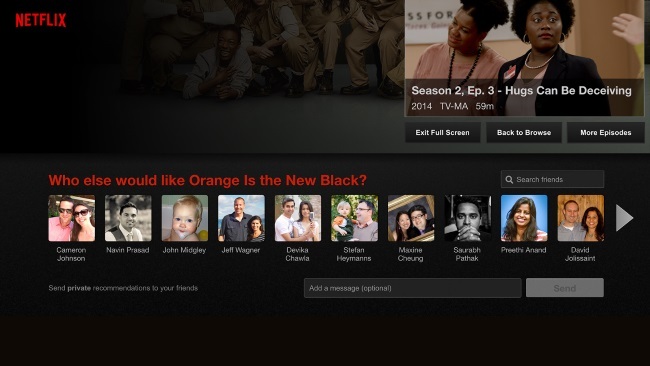 Netflix users will see messages after viewing content, asking them if they know anyone else who might like that content, and prompting them to connect to Facebook. After doing so, they can choose Facebook friends to send recommendations to, and those friends will see those recommendations the next time they log into Netflix. When you finish watching something, you’ll be asked if you know anyone else who’d like that show, and prompted to find your friends by connecting to Facebook. Connecting will not post to Facebook or share what you watch to your friends’ News Feeds. After selecting friends from a row of their pictures, and adding an optional message, click send. Your friends will receive the recommendation the next time they log into Netflix. They can thank you for the recommendation, and if they watch it or add it to their list, we’ll let you know. For friends who have not yet connected Netflix and Facebook, we’ll send your recommendation as a private message to Facebook Messenger. The feature is available on the website, iPad, iPhone, PS3, Xbox and many set-top boxes and smart TVs. We’ll be adding additional platforms in the coming months. For us, it’s about trying to find a new social model that works for on-demand television. Most people already tell their friends about TV shows or movies they like. We’re trying to make that experience seamless and quick within Netflix. We’re trying to emulate the way people talk in their real lives. With linear TV, everyone watches big events at the same time. With on demand, people watch at their pace on their own screens. This is a more modern water cooler. 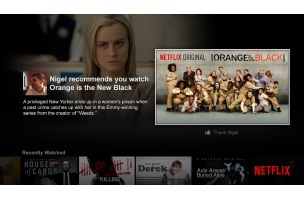 Readers: What do you think of Netflix’s new social recommendation feature?